This selection of beautifully detailed illustrations covers nearly 200 years of Australian wedding fashion, drawing on the impressive fashion collection of the Museum of Applied Arts and Sciences. 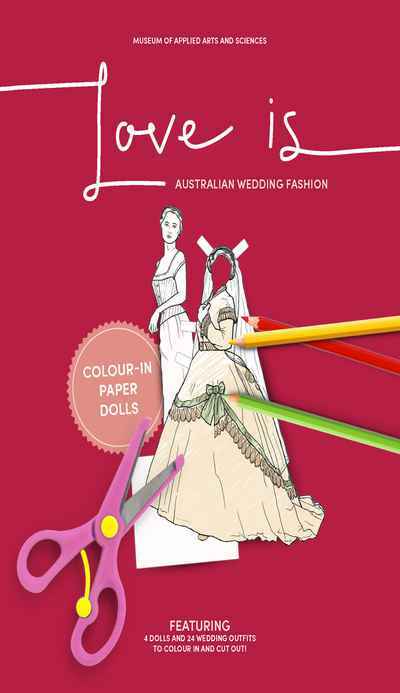 The Love is … Australian Wedding Fashion exhibition at the Powerhouse Museum (May 2017 – April 2018) presents wedding style and stories from the beginning of European settlement to the present. Like the exhibition, this selection of 24 black-and-white finely detailed illustrations covers nearly 200 years of wedding fashion and accessories in Australia and draws on the extensive MAAS collection, one of the largest public fashion collections in Australia. The book includes Australia’s first surviving wedding dress from 1822, lavish goldrush fashions, elegant 1920s and ’30s gowns, unconventional styles of the 1960s and ’70s, as well as contemporary designer fashion and a Wiggly wedding. From Irish crochet to Chantilly lace, custom-designed couture to adaptable day dresses, these creations are as varied as the men and women who wore them and tell the stories of changes occurring in wider society. Although traditionally white, bridal fashions can be as colourful as imagination allows! Presented by the MAAS Centre for Fashion.